Diversification is one of the most important components of today’s most sought after teachers. Learning how to become a high school Spanish teacher may provide you with the tools and resources necessary to enable you to land a long term position in this type of setting. Contrary to many student beliefs, those teachers working as Spanish teachers have a long history with more than just the language itself. They also have experienced the lifestyle, culture, and overall economic conditions of this language. Those that have this type of experience are more in demand. Most high schools require students to take foreign language education. In fact, many students are learning Spanish in elementary school. Spanish in particular is in demand mainly because it affords the student an opportunity to speak to people within their local community. This enables an individual who becomes a business owner to communicate with customers. It allows the student who later becomes a social worker to interact with children who speak the language, too. According to Forbes.com, 1.5 million college students enroll in foreign language courses each year. About 823,000 students at the college level enrolled in Spanish coursers in 2006. It is by far the most important and valuable foreign language class available to students. In order to perform well at this level, most students have taken two to four years of Spanish at the high school level first. Keeping this in mind, individuals who wish to learn how to become a high school Spanish teacher must enroll in the proper educational programs to be in this level of demand. To work in this field, individuals need to complete a curriculum that focuses on both language development as well as teaching skills. Often times, some of this education can be obtained from online sources. Consider the following requirements and steps for becoming a teacher of Spanish. Students must enroll in an accredited college or university to obtain a bachelor’s degree in Spanish education. This is a formal program offered by many teaching schools in the United States. Students must earn a teaching license. To do this, the student needs to sit for the state required exams after completing his or her education in the field. To be valuable to the school, Spanish teachers need to embrace the culture. Studying abroad in a Spanish-speaking country, whether that be Mexico, Spain, or any Central American country, is less important than the experience that the teacher develops there. The teacher must develop a competency in conversation in this foreign language. He or she must be considered fluent in it in order to teach for it. This is often tested extensively during the licensing phase. Most often, students will need to complete student teaching in order to obtain a teaching certificate, and, in most states, to obtain a bachelor’s degree in this area. 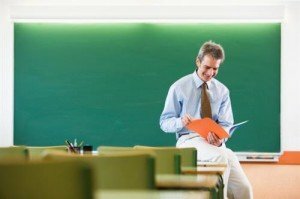 Student teaching allows the would-be teacher to teach students in an actual high school under the instruction and guidance of a certified professional. In some states, students must continue their education and obtain a master’s degree in Spanish education. This, too, may be possible to complete online through educational programs geared towards graduate level studies. Obtaining an education to become a Spanish high school teacher is a must. Then, over time, the student can develop skills while on the job, becoming more valuable as he or she does so. According to the US Department of Labor, the median wage for a foreign language teacher is $58,670. Students interested in this career path will often want to invest time into developing skills both in teaching and in Spanish conversation.